The NROL-71 spy satellite and its United Launch Alliance Delta IV Heavy rocket at Vandenberg Air Force Base in California. The United States will have to wait a bit longer to get its newest spy satellite aloft. 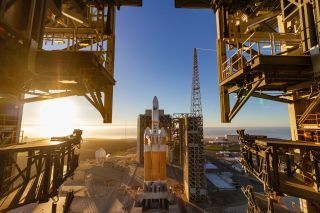 The secret NROL-71 reconnaissance satellite was scheduled to lift off Wednesday evening (Dec. 19) atop a United Launch Alliance (ULA) Delta IV Heavy rocket from Vandenberg Air Force Base in California. But controllers called the attempt off about 10 minutes before the planned launch, after noticing an issue with the rocket. "The launch of a United Launch Alliance Delta IV Heavy carrying the NROL-71 mission for the National Reconnaissance Office was scrubbed today due to indications of elevated hydrogen concentrations within the port booster engine section," ULA representatives said in a statement. "The team is prepping for a 24-hour turnaround on Thursday, Dec. 20, from Space Launch Complex 6 at Vandenberg Air Force Base," they added. "The forecast shows an 80 percent chance of favorable weather conditions for launch. The launch time is planned for 5:31 p.m. PST." You can watch Thursday's attempt live here at Space.com, courtesy of ULA, beginning at 8:11 p.m. EST (5:11 p.m. PST; 0111 GMT on Dec. 21). You can also watch directly via ULA. This is the latest in a series of launch delays for NROL-71, which will be operated by the U.S. National Reconnaissance Office. Attempts on Dec. 7 and Dec. 8 were scrubbed due to technical issues, and a Dec. 18 try was called off because of high winds.